Halloween doesn’t have to be all about sweets and chocolate. 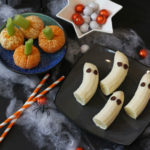 Try making these fun and healthy Halloween Fruit Snacks instead! Peel the clementines but leave them whole. Stick the piece of celery into the middle. Peel the bananas and cut them in half. Push the chocolate chips into the bananas to make eyes.